In January 2014 I was asked to arrange a corporate trekking event for a major international company which required a disabled member of their Southeast Asia team to complete a 40km high altitude trek. I met the client in Singapore at their corporate offices to discuss the project and by the end of the meeting I decided to accept the commission. The project would require the disabled member of staff and a disabled friend to complete the trek in June 2014 with a small support crew. Because Paul could only walk 5km per day I thought it vital to undertake a reconnaissance trek in February once a trekking route was agreed. Paul had been paralysed three years previously as a result of a cycling accident and his friend, Greg, was a polio victim. Because of these factors I considered the recce trek to be very important as for the June trek. I needed to know every inch of the route Paul and Greg would take. They and their families had many concerns and when we met again in March, after the recce, I was able to provide reassurances to them. In early June we all met in Leh, the capital of the Indian province of Ladakh in the Indian Himalaya. Leh is located on the Indus river at an altitude of over 3,500m so an acclimatisation programme of several days is always needed in Ladakh. As part of this acclimatisation we undertook some short walks around Leh and then drove over the highest road pass in the world (Khardung La – 5,359m) into the Nubra Valley for two days. Back in Leh we were joined by our film crew and made our final preparations for the Sham Trek along the old royal trading route which linked lower and upper Ladakh. The Sham Trek is a good introduction to trekking in Ladakh as it passes through spectacular scenery with picturesque villages where it is possible to experience traditional Ladakhi cultural with local people who have a lifestyle unchanged for many generations. The 40km trek would take five days with four nights camping at altitudes of about 3,500m but with daily climbs to over 4,000m to cross high mountain passes. This trek was to be an arduous and physically challenging walk for Paul and Greg but they coped very well throughout the trek which involved a couple of longer days to reach suitable campsites in the arid mountain terrain. The nights were cold and I was pleased I’d taken my Rohan Nightfall Jacket (100% premium white goose down) with me. Compressing down to a very small size it soon lofted up at the end of the day to keep me warm. I’ve worn this on Kilimanjaro and on Mera Peak in Nepal as well. The single thing I forgot to take on this trip was a flannel. Typically on trek, clients get a bowl of warm washing water every day and this can go a long way with a flannel but I’d left mine back home in Wales. The one ‘not so good’ think about Ladakh is that it’s not a particularly easy place to get to and often involves an overnight stop in Delhi on the outward journey. Paul and Greg and the support teams coped well on the trek and it was a pleasure to work with them. The food provided by the cook was excellent with plenty of options at every meal and generous helpings. Two of the five days trekking were 9km which left Paul feeling very exhausted but after a good meal and a cosy night in the sleeping bag I’d loaned him he was raring to go the next morning. It was an emotional trip in many ways, helping Greg and Paul to achieve their dreams of trekking involved hard work and often pain crossing high passes but they never faltered and did everything asked of them. 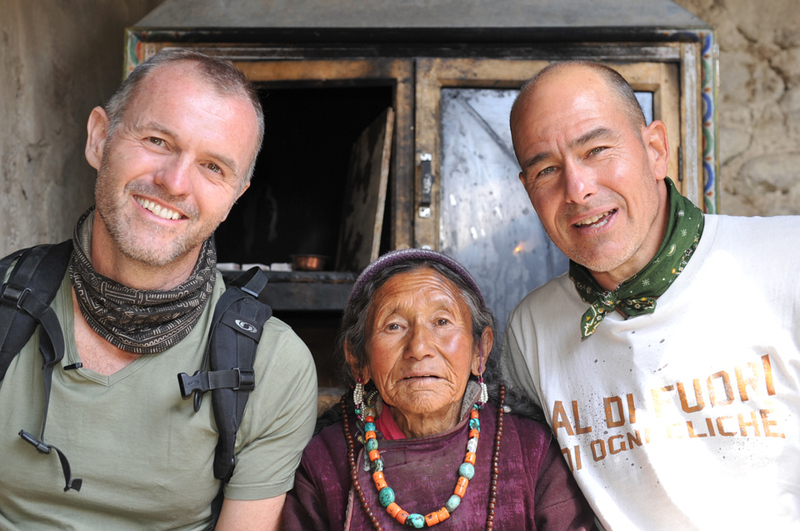 The highlight of this trip was simply being able to help Paul and Greg achieve their dreams of completing a Himalayan trek. As an International Mountain Leader, it’s the most significant and rewarding adventure I’ve ever been on in my professional life and I’m really pleased I was asked to manage the project.